1 How Is Gum Disease in Dogs Dangerous? It arises from a build up of plaque that, when left unattended, forms a tough layer of yellow tartar beside the blood rich gum line. Bacteria now have easy access to the blood-highway. This is bad news. This means the immune system is in a constant state of arousal, defending itself from invaders, drawing daily on the bodies resources leaving the patient more vulnerable to disease. Worse still it has a knock-on effect on other organs too. Even with a cracked tooth or periodontal disease that damages gums around the teeth, your dog would probably eat normally, wiggle happily at your return home, and overall act like the same dog you know and love. Your pet may be in chronic pain, but you wouldn’t know it. Why? Dogs have evolved to hide such chronic pain. Their animal instinct is not to show signs of weakness. Daily chew time. Another way to keep your dog's mouth in top form is to give them safe toys and treats to chew every day. Go for bones , chew roots , dental sticks , Buffalo Horn and add Plaque Away to food . And steer clear of fuzzy tennis balls, whose abrasive surface can wear a dog's teeth down as they chew. Good-quality dog food..Is a must as the cheaper foods don't have enough atural ingredients in them to keep the immune system boosted This may mean feeding your dog foods with extra additives such as Plaque Away that helps keep plaque from forming or hardening, or dried foods and treats that help scrub your dog's teeth as he chews. Look for broken or discolored teeth. Check your dog's mouth for odor, especially odor that returns within one or two months after a cleaning. Look for bleeding in the water bowl, or when your dog is playing with a chew toy. Check for lumps or bumps in or around your dog’s mouth, especially any swelling present on one side but not the other. Be alert for increased resistance to toothbrushing. Notice if your pet is turning away from food. Listen for chattering jaws when your dog eats. 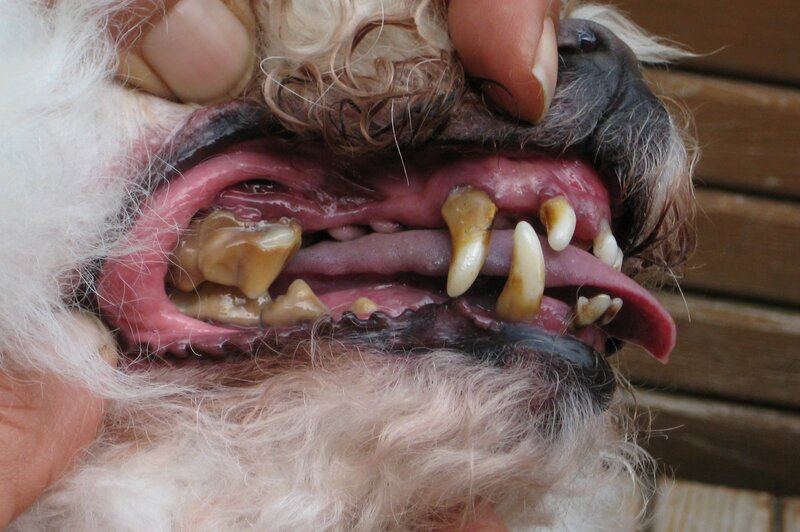 If you see any of these issues while caring for your dog's teeth, talk to your veterinarian right away; your pooch may be in pain and need urgent oral care. How Does Plaque Away Work? The ingredients of this product reduce tartar build up in your pet, Plaque Away is a natural, organic, herbal and seaweed blend which, when sprinkled on the food morning and night, will work systemically through your dog’s saliva, killing bacteria, freshening breath in days, and loosening tartar in 5-8wks. Over time the simple action of chewing on his toys or eating his dinner will be enough to remove the tartar from this teeth, or better still to be easily removed by the simple chewing of a nice, fresh bone, which is a dog’s natural toothbrush , Bufflo Horn . Made in England, Plaque Away contains no artificial chemicals, additives or preservatives.